gorgeous card, so I shamelessly used her idea with my flower. Thanks, Imastampin! 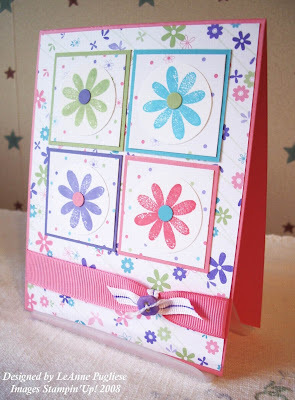 I used the large flower from the level 3 hostess set, Time Well Spent, and embossed it in white on cardstock vellum. I then colored in the flower on the back with markers. You can see I went out of the lines a little, oh well! I mounted it on Blush Blossom cardstock, a color I NEVER use! This card is 4 1/4" square, by the way. I then used my craft blade to cut through both layers and threaded through some Mellow Moss gingham ribbon. I used a My Favorite Things sentiment, added a little tiny rhinestone to the center of the flower. I mounted everything on my Mellow Moss card, and it is done! Off to work today! Thanks for looking! Okay, this challenge title is a little stretch of the imagination! The SCS challenge today was to make a card that reminded you of a song, or had music in it...something like that. I was still struggling to do yesterday's challenge, so I just said "forget it" for today's!! But when I finished this, done in Sage Shadow, I thought maybe I could get away with it! Bear with me here! I just got my Basic Grey Two Scoops and was salivating at this paper, so that's where I began. The image I had found on my table, stamped a couple days ago and never finished, so I added that. Then I remembered I was hoarding (again) the beautiful ribbon I just got from Papertrey, so I added that. I added some swirls in the background because I was trying out Beate's technique from yesterday as well!!! The whole thing is finished off with a little sentiment punched with the small oval & mounted on two squares, one of Blue Bayou and the other the BG DP. Maybe I'll add some glitter, but I gotta go make dinner! (that sort of rhymes!) TFL! I was shopping the other day in a fabric store and saw this cute polka-dotted fabric in rich earth colors on a dark background. I thought to myself that I could stamp something like that! So this is my take on that inspiration. I had an idea also as to how to space the dots evenly, since I don't have that cute Papertrey Polka Dot set (yet), so maybe I'll do my first tutorial on that a little later, after I iron out all the bugs! It's not hard, just a tad time-consuming. This one took a little longer because I did it in Versamark, then colored each one with pastels. I am trying to use them a little more since they have been neglected! 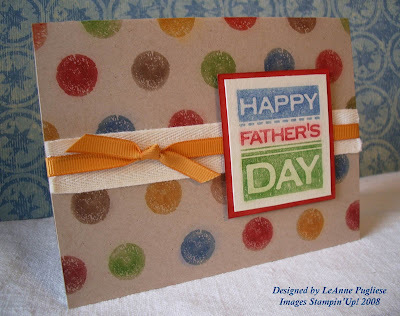 Since the background is pretty bold, I thought a sentiment was all I needed; when I saw the Father's Day stamp from All Holidays, it seemed just right--it was a bold design, just like the dots, and I could use the same Versamark/pastel technique as well. I added some twill & ribbon (hope that doesn't seem too feminine???) and it was done. I want to experiment with some different-sized dots, maybe in some spring colors this time! Thanks for looking! Today's color challenge on SCS was to use River Rock, Black & White. This is a really striking combination and there were lots of great samples! Mine uses a set that is on SU's dormant list. What in the world is that? Those are stamps that are still available for sale through SU, but are not in the current catalog. 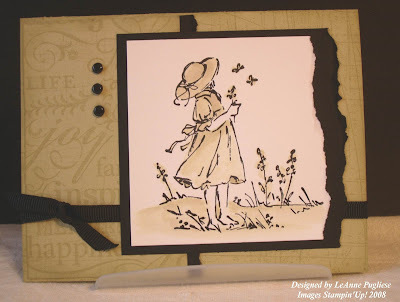 The set is called Summer by the Sea, and this image is simply stamped in Stazon Black and watercolored with River Rock by squeezing my inkpad and taking the ink from the lid. The background is stamped with Sanded; the left panel is stamped with Tres Chic AND Sanded, then the edges were sponged. I added some black grosgrain & black brads, and my card was done. Oh, I also ripped the edges of the white & black pieces, just to give it a rustic look. Hope you like it! Don't forget--you can click on the photo for a BETTER look! This is another double challenge: a Featured Stamper (Mary Jo Albright) and a Technique challenge, which was to use different designer papers. 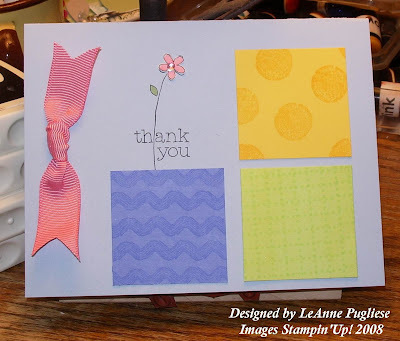 It is easy to coordinate papers when you use Stampin' Up! products because all their papers within a package coordinate!! 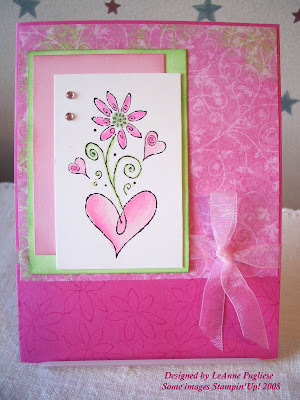 I chose Flowers for You and the flower from All Through The Year and just stamped it in the four colors of the DP! I made my own striped ribbon by using a Lovely Lilac marker and a ruler on our white grosgrain ribbon; the button was a tan one from Earth Elements, and I also colored it with the marker. The color didn't look quite right, so I added a little Bliss Blue pastel which seemed to make it match. I never did that before so I don't know if the color will rub off without some sort of fixative!!! This is my attempt at a round card! I thought I would play around with my Nestabilities after I saw MishMash's cute samples here. She is SO creative!!! It took a couple tries to get the cardstock to cut all the way through, but I am pleased with how nice it looks! I am sadly lacking in any cutesy-type Easter stamps, the only current one I have is from Holiday Blitz, which is a great stamp set to have!!! But it really wasn't what I was looking for, but I used it anyway. 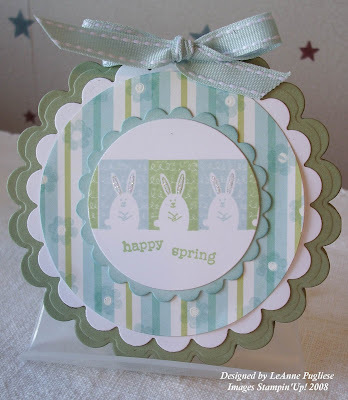 The Stamp-a-ma-Jig helped me to line up my little bunnies. They are stamped in Soft Sky & Certainly Celery, layered on Soft Sky, Dollar Store DP, WW and Mellow Moss. Probably would have looked better on Certainly Celery, but that's what I started with & was too lazy to do another one! 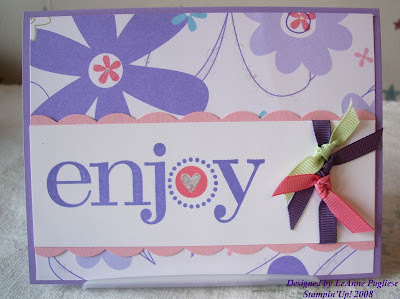 I also stamped the little flower from Enjoy Every Moment on the DP. It is finished off with some stitched ribbon & DD on their lil' ears! Thanks for looking! This was a tough, but interesting SCS challenge. 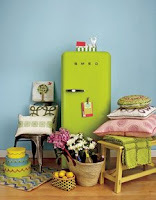 We were to get our inspiration from this photo from Country Living. I must say, these colors together were certainly unusual! I wanted to use that funny green, but SU doesn't have anything that color, so I brayered a piece of Gable Green with Summer Sun and came pretty close! I also wanted to use the colors in the stack of boxes in the lower left, but I just couldn't put everything together and I almost gave up in frustration.Then I remembered a neat layout from Betty on SCS, so I decided to pare it all down and use her example. I added a little sentiment from the level 1 hostess set For a Friend, added a ribbon & some bling, and it was done. Definitely happy colors!! I have a friend & customer who loves "punny" sayings, anything fun & catchy on her cards. She is also an Artist Trading Card nut, she trades them all the time with people all over the country, and is always giving me some! Unfortunately, it's all I can do to keep up with cards, let alone ATCs, so I rarely make any in return. But I did see a cute card probably on SCS and I thought this would make a funny ATC to give to her. It is very simple, but I think she'll like it! If I had kept the hostess set with the bra in it, that would have been perfect, but I had to come up with something else. Two petals from the big flower in the Enjoy Every Moment set ended up being the "bra"; I used some shiny rattail ribbon for the straps (that was the hardest part--taping those things on!) and added a little rhinestone to the center. The words were stamped (still practicing on using these) with Rough Edges Alphabet (Kristina Werner makes it look so easy! 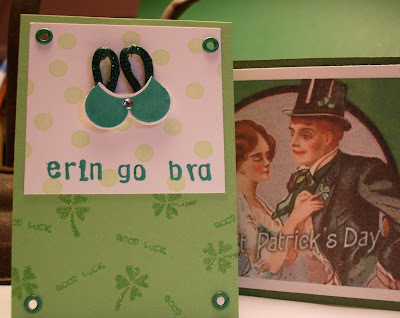 ), and the little shamrocks (retired) were stamped in Green Galore craft ink & embossed with Iridescent Ice EP. Brads added a little extra touch because it looked a little bare! Happy St Patrick's Day! 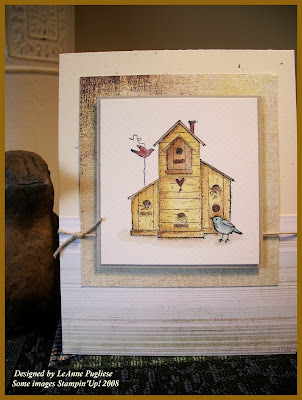 This was a fun, simple card to make that took care of two challenges: Beate's Weekend Sketch and SCS Limited Supply Challenge! I used some DP from a huge mat pack from ACM (don't think I'll EVER use the whole thing!) 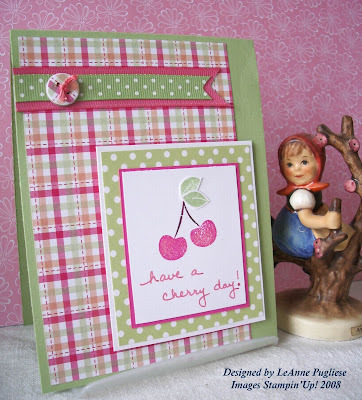 in some fresh colors and the cherry image from All Through the Year, which is a great all-around stamp set. The Limited Supply challenge required us to hand-write something on our sample--yikes! Not real comfortable with that, but I used a Spica pen for my sentiment and it looks okay......I guess! I cut the leaves from the leaf image and glued them over the little puny cherry leaf, added some ribbon and made my own button with a chipboard circle covered in the plaid paper, punched & tied it with some embroidery floss. Thanks for looking! I love this set, I just don't use it enough! Today's SCS challenge was to make a window card, so despite the fact that I really don't like these colors, I like the idea! I CASE'd it from someone, but don't know who (CASE means Copy And Steal Everything); if I knew, I would give them credit, cuz it's darn cute! 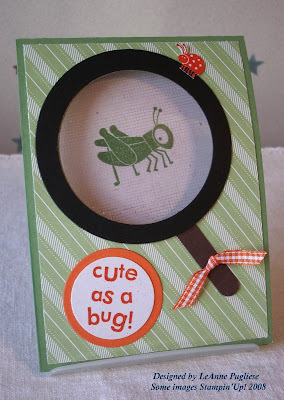 The magnifying glass is acetate on which I have used the Canvas stamp. The Nestabilities Dies make it very easy to die-cut big openings like these. TFL! I have a Stamp Club meeting tonight and I was scrambling a bit to get some new samples made with my new Merci! set. These are lazy cards....just a couple layers and embellishments, but again, I like simple, and I like watercoloring, so these appeal to me. Both the images are pointing to the northwest.....hmm, I wonder what that means? Snow tomorrow? Anyway, both cards use DP from Porcelain Prints, the images are stamped with on Confetti White with Black Stazon and are watercolored with my Aquapainter, and both sprinkled with DD glitter. Now, the Confetti White is not the best for watercoloring, but since these are small images, it's not too bad. It just has a tendency to wrinkle and absorb a lot of the water so the colors are difficult to blend. On the butterfly card, which is a standard-size card, I randomly filled in the background flowers with pastels, something I haven't used for a while! I also broke out my hoarded Hodgepodge Hardware to accent the stitched ribbon. I left an empty space for my sentiment, which I'll fill in later. 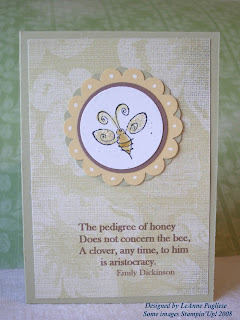 For the bee card, which is a smaller notecard size, the sentiment is one I found in a cookbook, and thought it would be sweet with this little image. I printed it right on to the DP on my printer--didn't it come out great?! The bee is mounted on two scallop punchouts that have been layered and offset. I added some dots with my white gel pen. Thanks for looking! I usually love the color challenges on SCS, and today was no different. However, I guess because I have a sinus headache today, I really struggled with this card. It is actually two challenges: the Featured Stamper from Sunday, Betty, who has AWESOME cards in her gallery, and today's color challenge. I should have made it larger than the 4 1/4" square that I did, that would have given me more room to play, but I also realized I don't have any Easter stamps! I had to scrounge up an Easter egg from the retired Tag Time, and I computer-generated the sentiment! I am just not feeling the love on this card!!! I used Betty's layout here, which I do love, so maybe another time when my head isn't pounding, I'll try it again! The orchid piece was stamped with the new Dotted Lines wheel, in all different directions; the pumpkin was stamped with the little flower from Little Pieces, accented with my gel pen.TFL! 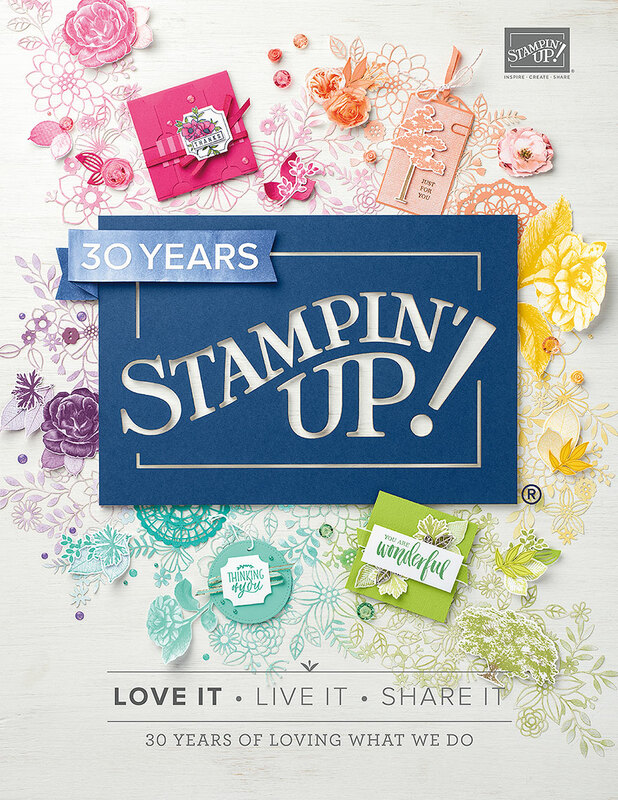 All stamps are Stampin'Up!. Unlike the previous card, this one came together quickly. I knew what I wanted to do, and everything worked well together. 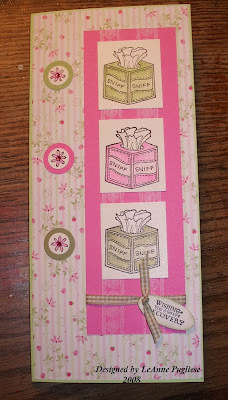 I needed a sympathy card, and it seems I always reach for this set because it is so versatile. 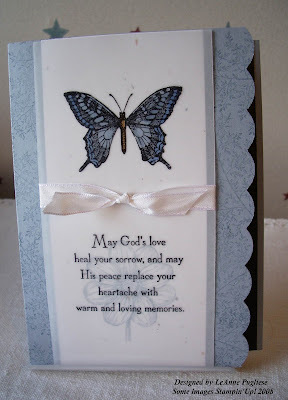 I stamped both the butterfly and the sentiment on cardstock vellum in Stazon Black. I colored the butterfly on the back of the vellum with markers; the floral image is stamped on the confetti white piece that I layered under the vellum. I love the soft look the vellum gives the stamped image under it. I stamped the background of the card with the fern stamp, scalloped the edge and then set off the scallop with a strip of Basic Black. A white taffeta ribbon ties it together. I think the whole card has a subdued classic look to it. 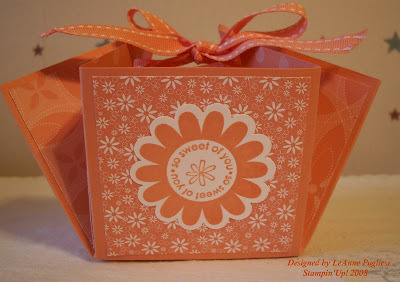 This is another SCS challenge, an Envelope Pouch, where we were to make a little gift bag out of an envelope. I used a larger envelope I had sitting around from an old box of cards to make mine. The tutorial can be found on SCS as well, it is VERY easy and adaptable if you don't have the punch! The weather has been SO weird here, 65 degrees this morning with rain, then sunny, now cold & raining again, so it was difficult to capture this cute project in the correct light! I am thinking SPRING, so I used soft colors of Soft Sky, Blush Blossom, Certainly Celery, Barely Banana and Pretty in Pink for the colors. The markers came out kinda weird on the envelope, but hopefully that's not too noticeable! Anyway, I hope it will inspire you to try this out the next time you need a little gift bag. All stamps are Stampin' Up! 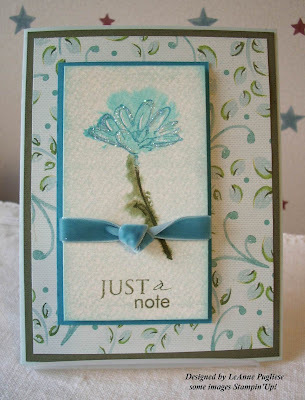 I LOVE this card....I love the image, the colors, watercoloring, the DP, the simplicity, everything! I don't know how much detail you can see on it (click on it to see bigger), but I loved this Garden Pleasures set from 2001, and don't use it much, but when I saw the Inspiration Challenge at SCS, my mind went to this stamp. The sun is setting here, so it was a little difficult to get my photo. It really doesn't resemble the inspiration, but I am a big birdwatcher, I love birds, so this is what I went with. 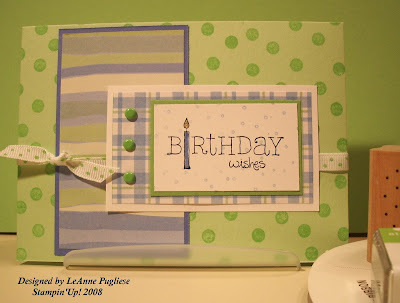 I also used the layout from Sharon Johnson's Stamp Simply Challenge as well. She always has great challenges! And since I am a birder, I must tell you, there is probably no bird on earth that looks like this, but it's my world so I can make the bird whatever color I want!!! :D (I made him that color so he would match the Figgy paper I used at the bottom.) He was stamped first, then I masked him and stamped the birdhouse on top. I also omitted the sentiment again, I will add it when I need to mail out the card! Thanks for looking! Wow, I almost forgot to post my daughter's birthday card! It is hard to believe she is 25 years old today! She has grown into a beautiful young woman. She likes green & purple, and stars, and bling! I don't have any star stamps, but I did have cardstock in green and purple and some bling, so I came up with this card that I think I cased from Lauren Meader. She likes flowers (one of her jobs is a floral designer) so that's why this card came to mind! The ribbon in the first photo looks black, but it is purple. 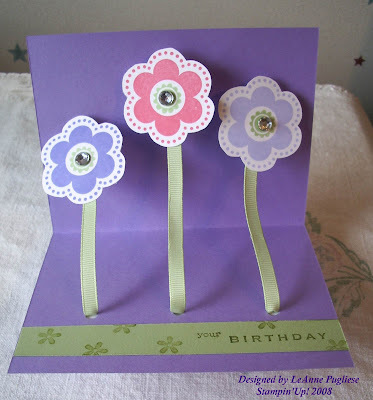 The flowers fold into the card when you close it. Thanks for looking! This would have been a cute Valentine's card, had I had the stamp set in time! 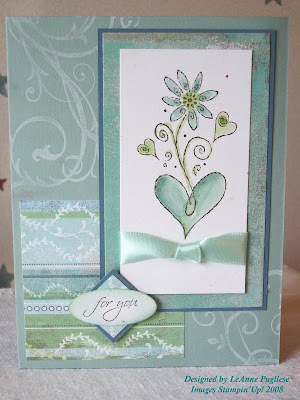 But I didn't, so I just made this card for Beate's Weekend Sketch Challenge. I did not add a sentiment, I'll put one on later when I need a card. This set is a Sale-a-bration set called Merci--I love this cute little set! It gives me a chance to watercolor, which I love to do! Plus there is a bee, although I didn't use it on this card. Someday I'll tell you about me & bees!! I also love that they are already die-cut! It makes assembling them SO EASY! The beautiful designer paper is from the Dollar Store, if you can believe it, and I thought the scrolled design fit nicely with the flowery image. The image is stamped on Shimmery White, which is very nice to watercolor on. Click on the image for a super-duper view and thanks for looking! I needed a quick thank-you card and I had this image already stamped & colored, so I just grabbed it and made it into a card. That's a good idea.....just have some images already stamped & ready to go, then if you need something in a hurry, you've got that part already done! I used Confetti White cardstock and mounted a smaller piece of Basic Grey's Figgy DP on top. It was rustic-looking and had the colors of dark green and a little red, which matched my image. I had stamped the image with Stazon on non-SU watercolor paper, then colored it with my trusty aquapainter (love that thing!) and ink from my stamp pads. This image is an old set called Country Collection----I got it at a yardsale for $1!!! Can you believe it? It is such a sweet little set, I wish SU would bring back this style---some of us still like this country look! I left a lot of white space around the image, and used a Cherished Memories Rub-on for the sentiment, then mounted it on Ruby Red, and then on the card. It was so easy to put the rub-on on the textured watercolor paper! Simple--my favorite! Hopefully I'll be able to do some more stamping today! Zany not Crazy - Maren always comes up with creative ideas, and as a busy mom, I don't know how she does it all! I get inspired when I visit her blog. Jodi's Stampin in London - I find it fascinating to see what SU has available in different countries! Jodi is a talented young stamper who loves to scrapbook, and I can't wait to see what she has coming up. Stamping All Seasons - Tracy is from New Zealand, and again, it is interesting to see what sets she uses in her card and gift-making, since they're retired here in the USA! She has some great gift ideas! Alison's Hand-Stamped Creations -- Alison is in my down-line and is a sweet, energetic, creative stamper who willingly shares all her ideas and passion for stamping with our Weeinker group when we have meetings!! I always get energized when she is around! 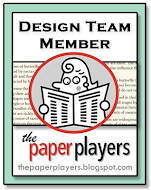 Again, please check these out & give these talented, dedicated stampers a hello! Ever watch "A Christmas Story"? It is my favorite Christmas movie, and my family groans because I know all the lines by heart. Ralphie's father is so excited because he has won "a major award" for solving a word puzzle! We all know about that ugly leg lamp, right! I even saw a stamp like it! Anyway, why am I talking about this? Someone named Laura has been posting very nice comments on my blog and said she gave me an Excellence award!!! It is on her blog, but I can't find her blog!!! So Laura, please email me through my regular email address so I can find YOUR blog, and thanks so much for your remarks!! 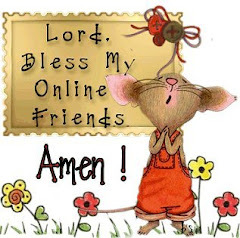 I have a very busy week this week, so if there aren't any postings, don't worry, I'll be baaaack!! Edited to add: I found Laura! You can visit her awesome blog here, I have been visiting it regularly because she is one very creative gal. I am honored that she even looks at my little blog! So I will need to pass this on once I get a breather! Thanks again, Laura. Be sure to check out her beautiful samples as well as the others to whom she has given the Excellence Award! I have been blessed to have three clubs this year!! 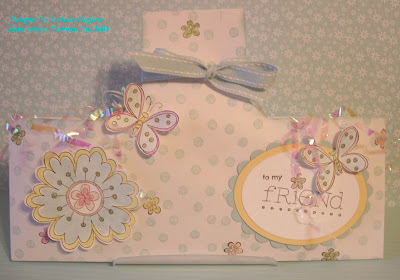 It is so much fun to get together with my stamping friends and catch up on all the news in their lives! These are two projects we did at my latest club. The square card is from Cornish Heritage Farms, you can see their take on it here. 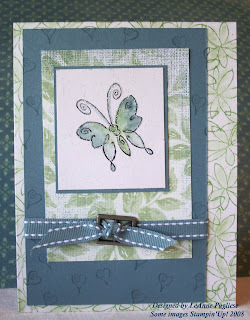 I wanted to make a more "boyish" card without the frills & hearts, so I call it the "Love Bug" card. It fits into a CD envelope. 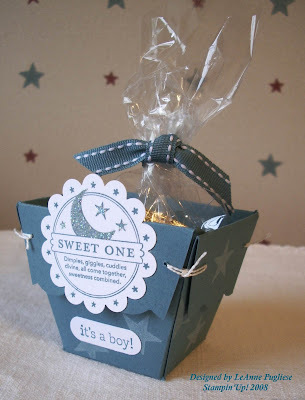 The next project was a treat box that Beate posted here. We made this is Groovy Guava cardstock cut to 8 1/4", with each section being 2 3/4". SU's Designer Prints decorated the outside, along with the Sale-a-bration set, So Many Scallops. Their stitched ribbon matches it exactly! Both projects were wheeled with Spunky Spots jumbo wheel---my favorite this week! The club thought these would make great Easter baskets! Thanks for looking! My sister and her family live in South Carolina and I miss them like crazy! 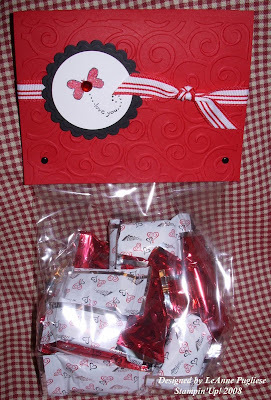 So I always like to send my niece & nephew little candy goodies for the holidays. This is a HUGE bag of Andes mint candies--the Valentine kind! We grew up LOVING anything chocolate & mint. My husband does not even like chocolate, so what kind of candy do you think we always get!!!?? These are a little thicker than regular Andes and have a heart on them. How do I know? How do you think I know?! :) The cello bag is the retired SU gusset bag, with a Real Red topper cut to a standard card size. 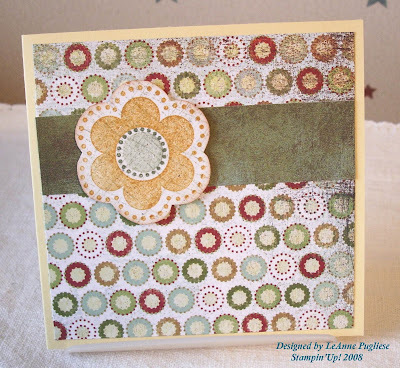 I cuttlebugged it with the D'Vine Swirls folder; the circle & scallop are Nestabilities diecuts, the image is from Happy Heart Day with SU's striped red ribbon. I added some glitter & bling, but I know this will last about 30 seconds (if that), so I didn't put a whole lot of time/product into it!! Also, I apologize for the photo quality.....it took me longer to try to photograph it than it did to make it! Click on the image to get a better look. I can't wait to hear from them when they get it! XXOO!! I am supposed to be cleaning.....but I am taking a "break"! And completing two sketches again, in one card. One is SCS's Limited Supply Challenge where you are to make a Valentine without any of the traditional colors or images. The other is Beate's Weekend Sketch, which are always fun. 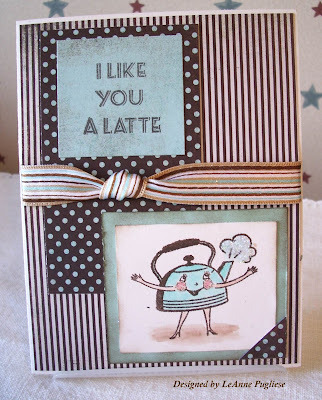 I hadn't used this little Crafty Secrets set Coffee & Tea lately, so I thought I would ink it up--I liked the sentiment! The paper is Basic Grey's Figgy along with some leftover Cool Caribbean I distressed to make it look like the Basic Grey. I also remembered some beautiful striped ribbon I had just gotten, and it matched! So I have never had a latte in my life, and I think it's probably made in a coffee pot, not a teakettle, but I just liked how the little teakettle looked like a little baby when they say "I love you this much!". Humor me here! Hope you like it! And always remember you can click on the image to get a better look!! This is a combo of two sketches on Splitcoaststampers: WT152 and SC162. I love polka dots anyway, so I put a few on here. The background is a new jumbo wheel Spunky Spots....don't you just love that name? 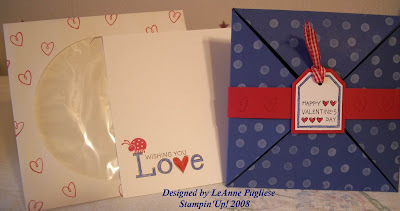 I also very lightly stamped little polka dots from Itty Bitty Backgrounds on my image with Bashful Blue ink. This little sentiment is a Level 1 hostess set this year....one of my favorites, there are 6 images in all. It only takes a $150 workshop to earn this set! Another polka dot is my ribbon. I made this myself with craft ink and SU's white grosgrain ribbon. Don't use classic ink, it will bleed through. The craft ink can be set with an iron or a heat gun if you don't feel like heating up your iron! Finally, three brads adds some more polka punch. Thanks for looking! 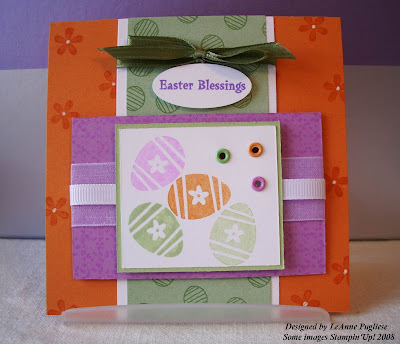 I have been wanting to make one of these cards designed by Lauren Meader here. She is just so funny & creative! So by chance, a sweet young mom in our church had a little girl, so this is the card I made to send to her. Not much stamping, I just used Nursery Necessities for the little chick on the front. It may be hard to see, but I also stamped the little flowers from All in a Row on the sleeves. I need to get a little better at the scallops & glue---looked like a first-grader did it! Be sure to check out all the other ones Lauren has done!! Well, I am not going to have time to stamp today, but I am posting an "old" card that I stamped before Christmas, and I am going to send it out in a day or so, so I wanted to share it with you. The flower is from Enjoy Every Moment, and it was stamped off in More Mustard on Confetti White cardstock, as was the center spot in Always Artichoke. The dots are also AA, but not stamped off. 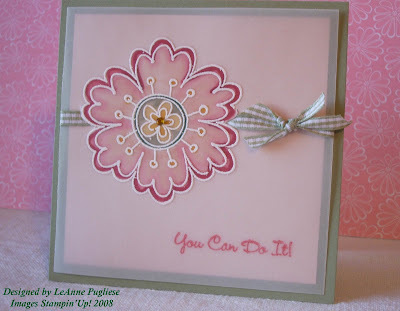 I then stamped over the entire flower image with my Sanded background stamp in Sahara Sand. I did this so that it would "match" the background paper, which is Basic Grey's Figgy Pudding. After cutting out the flower, I then sponged the edges to give it that rustic look. The card base is So Saffron, and it is 4 1/4" square. I purposely did not put a sentiment on it so that I could use it for any occasion. Thanks for looking! One of my downline, Karen, and I went around & around today as to how to make the little box on page 11 of the SAB catalog. After finally calling SU to find out that it was based on a tiny take-out box (and they don't make them any more!!!!) I found a box pattern on their website that was sort of the same, and made this little favor to showcase one of our Sell-a-bration sets, So Many Scallops. It's a little difficult to see, but the star from Nursery Necessities is stamped on the box itself. 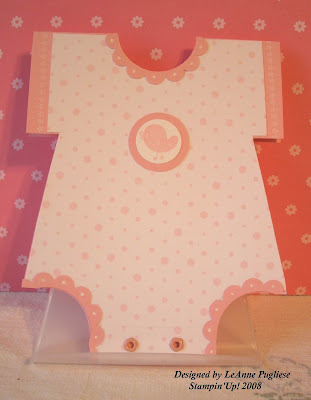 Once you cut the pattern out, the box was very easy to assemble. The hardest part was the needle & thread detail on the corners!! But it did turn out cute, don't you think? Click here for a link to the directions for the box in the SAB catalog (you can adapt yours however you want!) and here for the box pattern. M--M&M's give me a headache. I love them, but I pay for eating them! A--The A in my first name is a capital. Hardly anyone ever gets this right, I stopped being upset by it a long time ago! E--Eating is something I do WAAAYYYY too much of! But it's so fun! Well, I don't have but one other person that I know of who has a blog, and that is Alison....so, Alison, you've been tagged! I used to get rid of all my retired SU sets, but this past season decided I would hold on to some of the ones I really liked. Of course, that means less storage space and more choices when I want to stamp a card! But I hated to see this Petal Prints set retire, because I don't have many "pretty" stamp sets and I like the watercolor effect that you get when you stamp with it. After seeing Laurie Schmidlin's watercolor technique tutorial here, and seeing Sharon Johnson's challenge here, I decided to try to combine the two. Now I am not saying I did the watercolor technique exactly the same way Laurie did, but I gave it a shot! I used some Dollar Store DP as my color inspiration and used SU's watercolor paper on which to stamp the image. I got out my beloved (retired) Cool Caribbean to stamp the flower and Always Artichoke for the stem. Taken with Teal went over the first stamped image, but it just looked too glaringly white, so I brayered it with Soft Sky, which gave it a kind of linen look. I then added some DD glitter and some (retired) velvet ribbon. To kind of tie in the DP, I also stamped it with the (again, retired) Linen background in Soft Sky. Click on the photo for a closer glimpse. 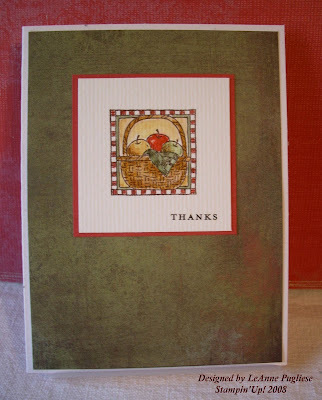 Finally, I added the sentiment in Always Artichoke using Papertrey's Paper Tray set. I added "a" with my AA marker. Enjoy! All I have been reading and hearing about is people being sick!! Today at my Stamp Camp, all I did was blow my nose....yuck! 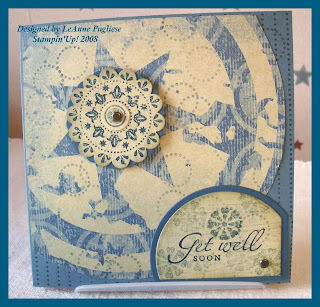 So when I saw Beate's Sketch Challenge, I decided to use my new Lockhart stamp to make this humongous get-well card. It fits into a business-size envelope, and there is LOTS of room to write a sweet note inside to someone who is a little bit sniffly! Hope all of you out there are feeling okay today!